There are so many strategies that businesses can use to be successful in their field and one of them is Quick Response Manufacturing. This strategy allows a business to be able to cut lead time when they are producing their products. When lead time is cut, an organization is able to market their product quicker and be more competitive. When successfully implemented in an organization, Quick Response Manufacturing helps reduce lead times by 95% which is amazing. While this figure might be low sometimes but there is no denying that Quick Response Manufacturing massively reduces lead time and waste leading to better efficiency. When an organization is efficient at what they do, the cost is cut down by 30% making Quick Response Manufacturing a massive incentive to implement as part of their operations. On top of letting organizations increase profits and reduce lead times, Quick Response Manufacturing also reduced the rate of shoddy goods by 60%. Based on the reasons pointed out above, implementing Quick Response Manufacturing is certainly a good idea however, for things to work; everyone in the organization needs to be fully behind the concept. Results are on instantaneous and will take time because an organization might need to change their culture to reduce their lead times and be productive. 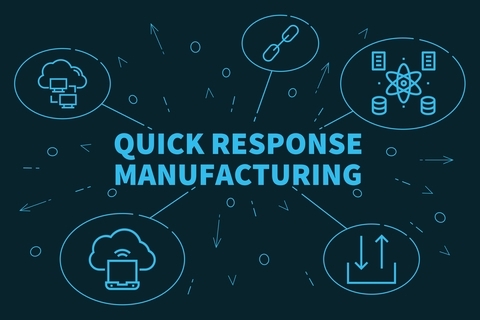 Quick Response Manufacturing is very much a time focused strategy that is perfect for organizations that have a low-volume, high-mix custom-engineered product. Organizations that make these products use Quick Response Manufacturing on top of other improvement methods like Six Sigma and Lean to put themselves in a strong position in the market. Many organizations across the world especially the ones that deal with manufacturing pay very close attention to cost management and scale strategies. This leads to a hierarchical department structure in their ranks as well as a degree of labor specialization. Quick Response Manufacturing points out that this sort of set up in an organization will not produce good results and actually does more harm than on lead times. The reason why this is not good is also that it introduces hidden costs which are what any business in the manufacturing world does not want. Time needs to be used wisely and it is a very important element as far as Quick Response Manufacturing is concerned. What is great about Quick Response Manufacturing is it provides organizations with tools and principles that help them create cells in low volume, high-mix environments. These environments are focused on what is known as a target market segment. This segment where leads times are cut short helps a business massively in offices as well as their floors where employees work on the products. Quick Response Manufacturing is a method that lets an organization apply time-based management principles to everything that they do. Everything from its supply chain, office operation, new product development, production control, and material planning works well with Quick Response Manufacturing to make sure that an organization is competitive. The cellular structure that Quick Response Manufacturing brings to an organization goes hand in hand by an understanding of system dynamics. These dynamics are designed for high mix environments. When a business applies common system dynamic principle, they are able to improve their capacity planning as well as optimize batch sizes. This helps an organization achieve a short lead time when manufacturing which is super important to do because no organization want to have a huge bill on their hands during their manufacturing process. The post What is Quick Response Manufacturing? appeared first on Shmula. [VIDEO] No More Excuses! Be Accountable!